The days of our existence as volunteers at the Olympics are differentiated by one simple question: is it a medal day? Ordinary days, when there are no medal events at the venue where you work, are quite relaxed. You can be a bit late for the start of your shift, having missed a couple of buses to admire the view. Being late for a shift is not really a good idea, but on a non-medal day it is allowed. On a non-medal day, volunteers do not have to rush to their positions right after they arrive: there won't be much work to do anyway, so they can go and have a meal whenever they want, take their time over a cup of tea or simply relax for a while. On days when the attention of the international media is not focused on your venue, everybody becomes more friendly and open. Colleagues, organizers and athletes are far easier to talk to. Nobody is under the burden of enormous responsibility and everyone is just doing his or her part of the work that allows the whole venue to operate. 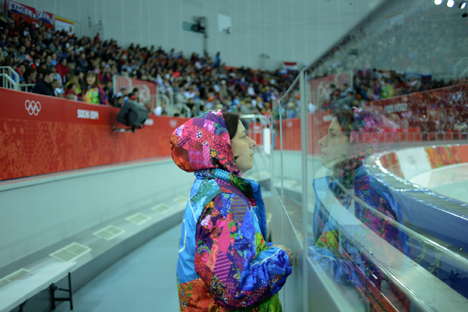 The few journalists and Olympic news staff service who find themselves, it seems by mistake, in the area rustle candy wrappers and offer sweets to passing athletes, who make comic faces and theatrical gestures, having to refuse them. Colleagues exchange latest news and gossip: "Did you hear that Kovalchuk was injured?" – "No, I don't believe it! "; "They've promised to bring an Olympic champion to our volunteers' village!" – "Lucky you! "; "I heard they are finally going to put up a curtain track in your room tomorrow." – "No way!" But when a medal day comes, there is hardly any time to relax. From the very first minute you enter the venue after a security check you feel how serious everything is. You are instantly grabbed by the elbow and asked to explain to a foreign visitor that he is not allowed to go to a specific zone. Somewhere at the back of your mind you still manage to grasp that the future of Olympic medals is decided now, that this is the most important moment in the life of the athletes whom you have grown to know and love, that the whole world is watching this moment. Yet these thoughts are just a background to the tasks and responsibilities at hand that you perform in this gigantic mechanism called the Olympic Games. On a day like this you don't have a spare minute just to stop and take a breather for a couple of seconds. You are caught in a whirlwind of events that drags you down deeper and deeper until you find yourself at the very bottom: at a bus stop in a Godforsaken part of the Olympic park at 4:30 a.m. waiting for a bus that is not due for another 55 minutes.